The most recent trend in mobile gaming has been customization–making your experience your own by growing custom strategies and gameplay styles. Monster Legends capitalizes on this, and today, Appamatix has the best “Monster Legends hack” as well as secrets, and tips that will take you from newbie to “monster master” in no time at all. Millions of people have already hopped on the wagon with this addictive little game, and since we’ve designed our guide with new players in mind, there’s nothing stopping you from getting in on the action. Do you remember Pokemon? I owned a Game Boy in the 90s, which means that for me and my friends, the craze was inescapable. 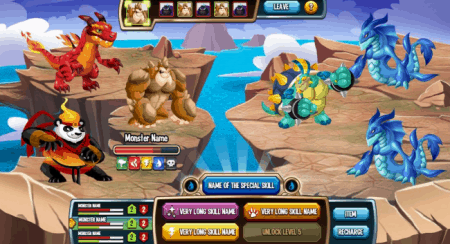 It’s still going on, too, and that consistent popularity for monster battling games has led to the success of Monster Legends, a game where…you guessed it, you raise and battle monsters! It’s not hard to see where Monster Legends’ inspirations come from, and that’s not necessarily a bad thing. Pokemon is a popular series across the world for a reason, but it’s only the progenitor of a genre. Since video games don’t exist in a vacuum, it can only be expected that other games in the monster battler genre are going to pick up on some of the same features, which is what Monster Legends has done. In true monster battle fashion, you’ll be finding, raising, and breeding monsters based on their rarity and “elements,” thereby allowing you to unlock and discover new monsters. You can train them up with food and fighting, and eventually take them to the competitive player vs. player scene, where you’ll be able to pit your own customized team of monsters against other players from across the world. It’s compelling stuff and a lot deeper gameplay than you might expect from a mobile game. Then again, mobile games have been showing us what they’re truly capable of more and more, each year. Since it’s not quite as simple of a game as it might appear to be on the surface, there’s plenty of room to succeed and fail as you learn the ropes of the game. It’s definitely possible to breed or raise a “bad” monster, so it pays to heed some of the tips and tricks that we’re eager to share in this guide. If you want to breed monsters that will topple your opponents, you’re going to need a plan, and you’re going to need to know what you’re doing. Monster battles have a lot to do with power, strength, and how much attention you’ve given to your beasties, but more than that, elemental affinities are going to determine the outcome of your melees. Monsters and their abilities possess certain elements, and each carries specific strengths and weaknesses that do not change! Therefore, it’s important to know the elemental affinities of your monsters before pitting them against opponents. When you’re playing against other players, this is more difficult to do. When you’re battling against CPU-controlled monsters for currency and rewards, knowing your elements can almost ensure victory, with enough preparation. Water is strong against fire but weak against thunder. Fire is strong against nature but weak against water. Nature is strong against magic but weak against fire. Magic is strong against light but weak against nature. Light is strong against dark but weak against magic. Dark is strong against earth but weak against light. Earth is strong against thunder but weak against dark. Thunder is strong against water but weak against earth. Got it? Good. These affinities can help you succeed more than any other knowledge in the game. Memorize these, and you already know more about “winning” in Monster Legends than the majority of other players. Breeding monsters is the name of the game if you want to improve, but you have to do it intelligently or you’re not going to get anywhere! There are four basic habitats in Monster Legends, and once you’ve unlocked them all, each can hold up to two monsters. Fire, nature, earth and water all support different types of monsters, and you’re going to see the best results when you breed monsters from different habitats. Crossing elemental affinities is the best way to get stronger monsters, whereas breeding monsters of the same elemental affinity should be reserved for those times that you only want to unlock new monsters–not necessarily when you want to get better ones. This feature of Monster Legends will take a little bit of playing around with in order to get right, but customization and exploration are par for the course in monster battler games! In the same way that elemental affinities matter, so too do team compositions! When you’re building a team of monsters to take into battle, keep in mind all of the different affinities that they have. Bringing three dark monsters is going to make your team extremely resilient to earth, but horrendously weak against light. If you bring a dark monster and magic monster, then you have that same resilience to earth, along with a strength against any light monsters that might try to attack your dark one. Thinking about affinities in your teams of monsters can help you to create an intricate defense that other players will have difficulty overcoming. It can be tempting to get caught up in the fun of breeding and raising monsters, without paying enough attention to the abilities that you’ve unlocked for each of them (or the abilities that you still haven’t unlocked!) Each monster has a different assortment of abilities, and if you want to succeed in battles–rather than just sitting around raising monsters all day–then you’ll need to know what they’re capable of! Tap over to your monsters’ habitats, then select individual monsters. Here, you can see their skills (both available and locked) before you ever bring them into battle. Happy monsters require food, and if you want them to grow (and grow stronger), you’re going to need to start raising food. The game allows you to build farms which where, in turn, you can plant a variety of crops. Allowing them to grow longer will increase their yield, and as your own level increases through more and more gameplay, you can upgrade your farms. As is the case with most free-to-play games, gems are going to be the thing that always seems to hold you back, no matter how good you are at Monster Legends. Of course, you’ll accrue gems naturally as you play the game, but it will never be fast enough to play at the speed that the game encourages you to move at. The answer (as the game proposes) is to use your own hard-earned money to buy some gems. If you can afford it, and you love Monster Legends, what’s stopping you? If you’re like me, though, you’re naturally resilient to the game’s attempt to weasel money out of you. Therefore, it’s important to plan your gem spending, and not give in to temptation. Consecutive daily logins will help you to earn gems, as will completing the daily goals that you’re assigned (more on that, next!) Additionally, you’ll get gems as you slowly level up, but the key word here is slowly. You’re not going to get gems quickly unless you pay for them, so keep that in mind as you progress. Of course, you’re going to need currency if you want to keep expanding your habitats and markets while also breeding more monsters. Every day, the game will give you a series of goals to complete that can net you the coins that you’ll need for proper upkeep. These are relatively easy, and just depend on your willingness to log in for a few minutes during your day and play the game! Keep on top of your goals, and you’ll soon find yourself with plenty of just about everything except gems. How does it always keep coming back to gems? Because it’s a free-to-play game; that’s why! Still, it bears mention that you can greatly increase your progress in Monster Legends by not using your gems to speed up your monsters’ hatching. It can be awfully tempting, I know. Sitting around, waiting for that egg to hatch is tedious, but you know what? Those gems are going to be a hell of a lot more useful later in the game when you encounter upgrades and items that require several of them. Do yourself a favor, and let your monsters hatch at their normal speed. Make a sandwich. Bake some cookies. Go for a walk! Your experience later in the game will definitely thank you for it. The monster breeding portions of the game can easily dominate your time and energy, but for most players, monster battling is where the real fun and rewards are at. It’s where you’re going to see the most payoff for your work, too. If you’ve spent a ton of time breeding great monsters, and you have a team with a great defense against many popular monster elements, then it’s time to throw down against other players. You’ll have to have achieved a personal level of 10, but if you’re looking for a place to test out your beasts and also possibly gain rewards, this is the area of the game that you should be building towards. Be brave, knuckle down, and test your mettle! Some say that you should start building your strategy as soon as you start playing the game, but I’m going to go right ahead and call foul on that! If you want to find yourself stuck in the middle of the road, with a strategy that seems half-assed and has proven itself ineffective, go ahead and start devising right off the bat. If you want to play it smart, wait to build your tried-and-true strategy until you’ve experienced every part of Monster Legends’ gameplay. Breeding, building, arena battles and more are all important to experience if you want a solid strategy, and partaking in everything the game has to offer is the best way to learn which types of monsters are going to give you the greatest success! Well, eager reader, what do you think? These top 10 tips and tricks (no “hacks” here) are designed to give every Monster Legends player a better chance of success, whether they’re newbies or veterans to the monster battler genre. They’re some of the best practices you can follow if you want to do well in the game, but that doesn’t mean we aren’t eager to hear yours! Post in the comments below with your own thoughts and tips!